Although the sport is called football, a player's hands catching and carrying a ball wins games. Catching the football is a skill that is needed for many positions on the offense and defense. There are some proven methods that can help a player catch more passes over time. When you’re hitting a baseball, one of the most popular expression is “Keep your eye on the ball.” In football, a common expression is, “Catch the ball with your hands.” It sounds like common sense, but, in reality, there are a lot of variables that go into accomplishing the feat. Catching the ball with your hands versus your body or your arms is probably the most important fundamental to learn early on. 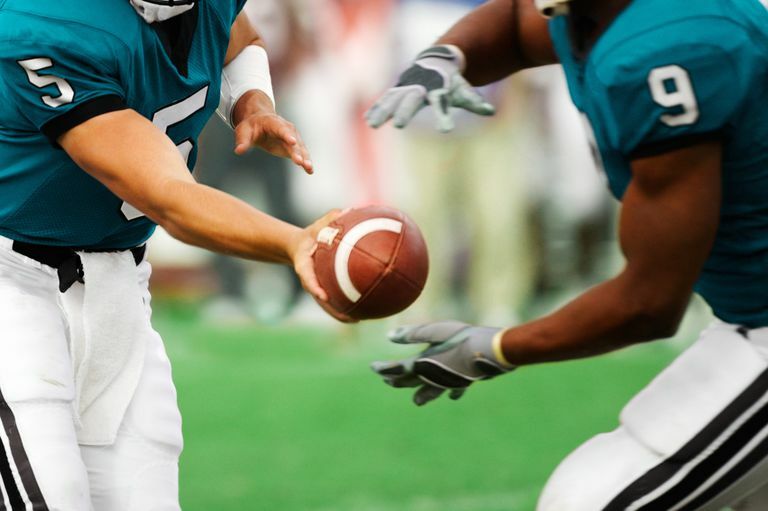 If you catch the ball with your hands, you have a better chance of actually keeping the ball, as the ball is less likely to bounce off your pads or helmet. You do not want to get into the situation where you are chasing down a defender who caught a ball that vaulted off of you. Once the ball is secured in your hands, you can quickly tuck it away. Tucking the ball will prevent it from being stripped by an opponent. Learning to catch with your hands will allow you to be able to jump for the ball, over a defender, or get to a ball instead of waiting for it to get to your body. If the ball is above your waist, make your hands into the shape of a triangle, with your thumbs and index fingers tented together. Keep the fingers wide in order to grip the entire ball, and then grab it and hold it. If the ball is below your waist, place the tips of your pinky fingers together forming a net below the knees. Your fingers need to be flexible, bent slightly and ready to absorb the speed of the ball. Your fingers, hands, wrists, and arms will all act as a shock absorber to slow the ball down and bring it under control. When the ball is thrown your way, find the tip and focus on it. As you reach up to catch the ball, you need to see the tip, but grab the fat part of the ball or the body of the ball. A great way to practice this catching skill is to color the tips of two or three footballs different colors. Have someone throw the ball to you and call out the color before it reaches your hands. This drill will get you in the habit of focusing on the tip. Make sure you stay focused on the ball until you have it tucked away. This skill is called, “looking the ball in.” So many receivers have dropped perfect passes because they had their eyes on something else before they had the ball secured. A good receiver has great feet as well as great hands. After all, the sport is called football. Once you have secured the ball, get a move on. Keep the ball tucked away and go. The best wide receivers catch well, but also make good yardage after the catch. When NFL Hall of Famer, Jerry Rice, was young, he worked with his dad as a bricklayer. His dad would throw him brick after brick, which helped develop the strong, flexible hands that made Rice statistically the most productive wide receiver in NFL history. There are many different ways to strengthen your hands, but the key to being able to catch the ball well is to practice. Set a goal to catch a certain number of passes per day. Get your eyes, hands, and fingers used to catching over and over again. After a lot of practice, the intensity of a game situation will matter less, superseding that will be the natural feeling of a ball coming your way. Your response should become automatic: See the tip, catch the fat, look it in, and go score.